SEO analysis was never this easy! Not just these! Also get access to Backlink & Ping, Google Adwords Scraper, URL Shortener, Coe Minifier, Malware Scan and lots more utilities..
All these for a LIFETIME at a price of $29.99 only. Believe us, you need it! Buy Now. It's an app to analyze your site visitors and analyze any website's information such as alexa data, similarWeb data, whois data, social media data, Moz check, DMOZ check, search engine index, google page rank, IP analysis, malware check etc. combined with some other great SEO tools such as link analysis, keyword position analysis, auto keyword suggestion,page status check, backlink creation/search, website ping, google adword scraper etc. 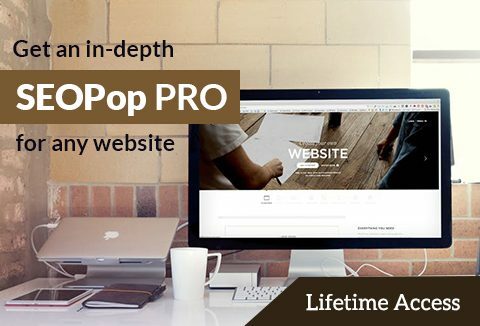 You will receive a 100% off discount coupon code with the redeem instructions file to get access to SEOPOP Pro upon purchase. Follow the steps in the redeem instructions file to avail LIFETIME ACCESS. Free updates and support included with this deal. Take advantage of SEO intelligence to help drive your site to the top of Google!